Below is the essay from Chapter 5 of the Foresight Africa 2018 report, which explores six overarching themes that provide opportunities for Africa to overcome its obstacles and spur inclusive growth. Download the paper to see the contributing viewpoints from high-level policymakers and other Africa experts. You can also join the conversation using #ForesightAfrica. Pour lire ce chapitre en Français, cliquez ici. In 2018 and beyond, digitization will provide an important avenue for African economies to leapfrog not only financial development but also development across other sectors of the economy. There are infinite opportunities on the digital platform, and fintechs are working round-the-clock to develop and introduce new products here. However, these changes will benefit only those economies that embrace digitization, invest in the required infrastructure, and introduce commensurate regulatory technology. Digitization is transforming African economies in four major ways: retail payments systems, financial inclusion, sustainable business models, and revenue administration. Given that Kenya has stood out in its success in pursuing and utilizing digitization, the experiences of the country, explored in this essay, shed light on Africa’s digitization potential in 2018 and beyond. Digitization and retail payments systems: Digitization has revolutionized the retail payments system and the payments infrastructure. Economies are saving billions of dollars per year by using electronic payments and centralizing those payments. The retail payments infrastructure is one of the earliest beneficiaries of mobile-phone based payments and transactions platforms. Electronic payments platforms save on transactions costs in terms of time, travel, and even unit costs. Indeed, this revolution cuts across rich and poor, underserved and unserved, and formal and informal businesses. Given this transformation, it is time in 2018 for all African economies to join the Better Than Cash Alliance (BTCA)—a global partnership that encourages the shift away from cash and towards digital payments—advocate for electronic retail payments migration, and develop the requisite payments infrastructure so that government payments can be centralized into an electronic payments platform. The potential economy-wide benefits are immense. We expect African economies to benefit from all these developments. Digitization and financial inclusion: Digitization has become an easier platform to support financial inclusion and female financial empowerment. Obstacles to financing access, such as physical distance, minimum balance requirements, little to no credit, and low-income flows can be circumvented. 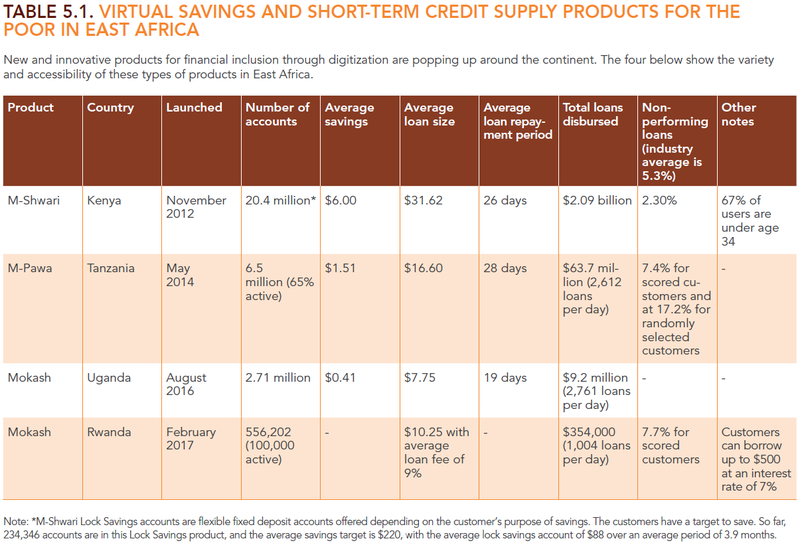 Savings have increased, micro-savers have opened bank accounts, and banks are now able to price short-term loans. In fact, currently there are over 20 million virtual savings accounts (one bank accounts for 18 million of these virtual savings accounts five years after the product was launched) that have been opened in the last five years compared to about 30 million deposit accounts in the banking sector. Not only has digitization in Africa brought financial services to the doorstep, it has been an important avenue for creating market access. The benefits are clearly widespread and attractive, and new virtual savings products and platforms continue to emerge (see Table 5.1). The entry point of digitization has been through the telecommunications sector, given the diverse products available on the mobile phone and its replication capability across countries. Virtual savings and credit supply platforms enable users to apply for loans, better manage fluctuations in their cash flow, and cope with unexpected needs. This combination of savings and affordable credit shortens the savings/investment cycles for the poor, providing a strong avenue for the links among financial inclusion, inclusive growth, and sustainable poverty reduction. Financial inclusion is thus not an end in itself, but rather an enabler of development, a supporter of progress, and a powerful tool to achieve the Sustainable Development Goals. Notably, in those countries that have embraced digital financial services, financial inclusion has improved, and strong banks have emerged as more people are able to open bank accounts. The increasing deposits from these bank accounts have enhanced the capacity of banks to intermediate savings and innovate. Digital financial services create opportunities beyond financial inclusion. For example, they have supported the formulation of effective and forward-looking monetary policy frameworks; the East Africa region is an important example. The fact that currency outside the banking sector has declined and innovations in the financial system continue to bring more products and participants into the banking sector is important for monetary policy signals. It has become easier to monitor transactions and activities in the financial system, and most countries in Africa continue to improve their anti-money laundering and combating the financing of terrorism regimes significantly. Finally, digital payments promote women’s economic empowerment by facilitating greater account ownership and asset accumulation, thus increasing women’s economic participation. Women can save in platforms and products that cannot be encroached; they are able to borrow and invest. Women in Africa are efficient savers and investors. Digital payments enable confidentiality and convenience. In many cases, this is the first account that a woman has in her own name and under her control. As noted in the 2016 FinAccess survey results for Kenya, formal inclusion among women accelerated between 2009 and 2013 due to considerable adoption of mobile financial services. Digitization and sustainable business models: Different products have been rolled out on the digital platform to cater to the other sectors of the economy, like energy and agriculture, to better reach a market segment or increase productivity. Digital platform sustainable business models can be developed across the economy to resolve the binding constraints and to support productivity growth in those sectors. Products like M-Akiba for micro-investors in government securities, M-KOPA for solar energy supply, and the One Acre Fund program in agriculture are making a difference outside the financial sector. One Acre Fund: Small-holder farmers in Africa require financial products that offer flexibility to accommodate their lumpy and seasonal income. One Acre Fund, operating in East Africa, has created a loan product that fits the needs of these farmers. The fund procures high-quality farm inputs (including improved seeds and fertilizer), ensures timely and convenient distribution of those inputs, trains small-holder farmers on the inputs to maximize returns on their investment, and assists in market facilitation to maximize profits. Since 2014, One Acre Fund has enabled farmers in Kenya to make loan repayments digitally using M-Pesa instead of cash. The loan product offers farmers flexible repayments with no repayment schedule on the M-Pesa platform: Borrowers can pay as little or as much as they want at any time and can complete repayment by the final deadline. This flexibility allows farmers to closely match repayments to cash flow and reduce pressure on household finances. The results from One Acre Fund show that a combination of farm inputs (including improved seeds and fertilizer) and convenient and timely delivery has enhanced productivity, increased income per acre by 50 percent and has generated a dollar impact of roughly $135 per farmer. M-Akiba: Launched in March 2017, M-Akiba is a micro-investment in government securities using the mobile phone payments platform. Notably, it is the world’s first mobile-only retail bond. The government aims to borrow KSh 5 billion (approximately $50 million) through the M-Akiba bond to fund government infrastructural development projects with a coupon rate of 10 percent. With M-Akiba, Kenyans can save money and earn interest every six months, with a small initial minimum investment amount per account of KSh 3,000 (approximately$30) and consecutive trades in multiples of KSh 500 (approximately $5). Table 5.2 presents the first intake of the bond after the launch in March 2017. It shows that the KSh 150.04 million (approximately $1.5 million) uptake of the M-Akiba bond was mainly dominated by small investors who invested less than KSh 10,000 (approximately $100). Those who invested the minimum amount of KSh 3,000 constituted 31 percent of the total investors, whereas those who invested between KSh 3,001 and KSh 10,000 constituted 34.5 percent. So far, 5,691 Kenyans have invested in this product at its initial phase. Thus, digitization has made it possible for micro-savers and micro-investors to participate effectively and efficiently in the financial system. In addition, this innovative domestic resource mobilization strategy allowed the government to access a pool of savings that was out of reach before to finance its projects and small savers to earn interest on their funds. The idea that small savers can use their savings to lend money to the government and make investments with good returns marks the success of digitization in Kenya transcending market segments. Water vending machines: Providing an adequate supply of water to households remains a challenge for government in several African countries. In Kenya, for example, an estimated 36 percent of the population does not have access to clean drinking water, with the problem acute in arid and semi-arid rural areas and urban slums. In Nairobi’s Mathare slums, a public-private partnership between Nairobi Water and Sewerage Company, Safaricom (a telecommunication company), and Grundfos (a Danish water engineering firm) resulted in the installation of water vending machines. To buy clean water, users loadForesight 2018_Chapter 5_web_FINAL points onto smart cards with credit bought on-site or via their mobile phones, then use the cards to access the water vending machines around the slum. With a simple swipe of their smart card, water is released from the main storage and into a waiting container. Through M-Pesa, payments are collected from customers more efficiently, while a cloud-based system receives and publishes all transactional and operational data from each water dispenser, ensuring accountability and reducing service costs. The machines are revolutionizing water availability and distribution to the poor slum dwellers that have long been at the mercy of water cartels. The outcome seems to show that with the introduction of this payments platform, unit costs have declined substantially. The weekly expenditure on water in the slum has been reduced from KSh 250 ($2.5) to KSh 2.50 (2.5 cents)—a 100 percent reduction on water costs. Electronic payments not only increase efficiency and cut out the middlemen, but above all flatten the market segmentation introduced by cartels. M-KOPA Solar: M-KOPA is an innovative solar power solution program that helps low-income consumers acquire high-quality, affordable energy. The M-KOPA inventors developed a proprietary, patented technology platform that combines an embedded global system for mobile communications and mobile phone payments capabilities to facilitate financing of the solar power equipment. Customers buy the solar home system on an affordable M-KOPA payment plan, with an initial deposit followed by daily payments through their mobile phones for up to one year. After completing payments, customers own the product outright. As of May 2017, M-KOPA had connected over 500,000 homes to affordable solar power with 500 new homes being added every day. The estimates from the M-KOPA solar program show that current customers will save up to $375 million over the next four years on energy costs and enjoy 62.5 million kerosene-free months of lighting. M-TIBA: The M-TIBA savings product is a mobile phone-based health wallet that enables one to save, send, and spend funds specifically for medical treatment. Money stored in M-TIBA can only be used to pay for treatment and medication at specific clinics and hospitals. M-TIBA uses the internationally recognized “SafeCare” standards to monitor the quality of care available at these facilities. Instead of paying hospital bills for relatives, friends, or staff, it is better to transfer funds from their M-TIBA account. This ensures that they can visit a licensed health care facility of their choice whenever they need to, empowering them to lead a healthy life. M-TIBA’s goal of deepening health care inclusion in Kenya is contributing to the realization of the Sustainable Development Goals. Users are encouraged to save as much as possible so that they are able to pay for health care services in full. Digitization will drive better revenue administration and service delivery: The fourth benefit of digitization is improved service delivery and better revenue administration. Kenya’s eCitizen digital platform has reduced bureaucracy and improved access to government services. Through the platform, Kenyans apply for Government to Citizen (G2C) services and pay via mobile money, debit cards, and eCitizen agents. The platform provides portals that enable individuals to access government services such as business licenses, permits, and registrations; obtaining driver’s licenses; processing police clearance certificates; searching for official land titles for Nairobi blocks; and applying for passports. Another lesson from Kenya is that once the whole economy has embraced digitization, it becomes easy to re-examine the payments platform that will support tax design. The principle of an efficient tax system is that it has low costs for collection and less room for evasion. New digital tax payments platforms are efficient and limit physical interaction between the taxpayer and the tax officer. With increased financial inclusion and more taxpayers having access to banks accounts and financial services touch points, the Kenya Revenue Authority (KRA) introduced electronic banking to expedite payment of taxes through a secure electronic payments platform in 2016. This development, together with the recent launch of iTax, has enabled single-view of a taxpayer window (one does not need to visit several counters/windows for tax assessment), improved reconciliations, matched payment and bank reports online, allowed for real time monitoring of revenue collection, and introduced system checks and audit trails. Leora Klapper and Singer, Dorothe. 2014. The opportunities of digitizing payments. Washington, DC : World Bank Group. http://documents.worldbank.org/curated/en/188451468336589650/The-opportunities-of-digitizing-payments.